This is a highly collectible limited edition of just 2,018 individually numbered copies. Contained in a specially produced cover, it includes a separate leaflet with enlarged images of the stamps, plus a short biography of the artist, Michael Turner. Includes your very own certificate of Authenticity. This 26 page book is packed with photographs, illustrations, facts and stats relating to the RAF from its birth to the modern day. It explores the pivotal role of Major General Sir Hugh Trenchard, its expansion and evolution during the inter wars, the RAF’s vital role in two world wars including a feature on the Battle of Britain, the part if played during the Cold War, as well as its humanitarian efforts. There is also a feature on the Red Arrows including a pull out page that illustrates some of this premier aerobatic team’s manoeuvres. 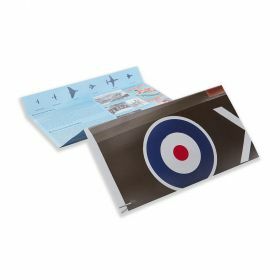 Comes with a separate concertina leaflet featuring blow up illustrations of Michael Turner’s paintings of the aircraft featured on the six stamps, a brief description of each of the aircraft and a short biography of the artist. 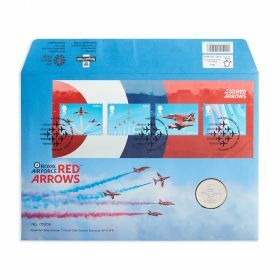 Features an authentic Ministry of Defence security hologram and the official RAF100 logo.